On a dark and dismal afternoon in October of 1923, the 11-year-old pauper, Albino Luciani, who would later become Pope John Paul I and rule for only 33 days before his death, was whisked away in a carriage to a minor seminary at Feltre, Italy. His father, Giovanni Luciani was there to give a two part farewell message to his beloved son. First he warned the young man not to conform to norms but to be an imitator of Christ among his peers. 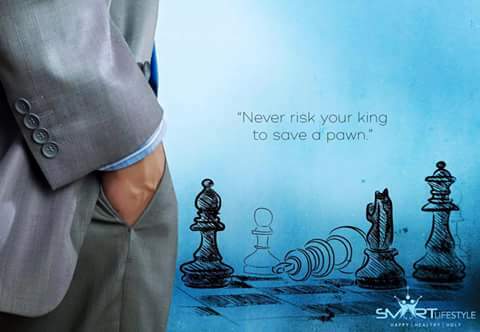 "Never risk your King to save a Pawn." Once the king is knocked out, it's game over; and you have lost the game even if you have all the other pieces. If you think of it, a king is essentially worth an infinite number of points because the game ends when it is lost. Are you risking your “King” to save a “Pawn” in your social, career, business and/or spiritual life? Are you risking the very thing possessing the greatest value to secure that of less or value? Are you risking eternal interests to secure temporal gains? Are you risking health, moral purity and dignity to secure prosperity, promotion, or momentary pleasure? Is any pawn pushing the King out of your game while giving you false assurances that you will be wealthier and happier ever after? Never risk your Heavenly King to save any earthly pawn! If you have Him, you have everything! But, if you lose Him, eventually you will discover that you have actually lost everything, even if you have all that this world can offer. Rather, risk a pawn to secure a King.